Robert Louis Stevenson was a Scottish novelist, poet, essayist, and travel writer; but he is probably best known for Treasure Island, A Child’s Garden of Verses, Kidnapped and the Strange Case of Dr Jekyll and Mr Hyde. A chronology of all of Robert Louis Stevenson’s writing by first publication date. 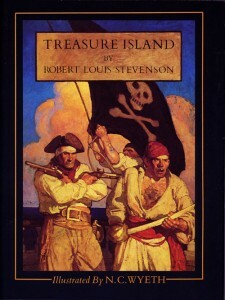 Treasure Island is one of the most famous adventure stories in English literature. The lasting appeal of the story is supported by the fact that there are more film versions of Treasure Island than almost any other classic novel. First published in 1881 (but as a book in 1883), it is a gripping coming-of-age tale for main character Jim Hawkins. The voyage that transforms Jim takes him away from his calm country life in England, to the high seas aboard the ship Hispanola and to the unknown island where the pirate Captain Flint buried his treasure. Background: Treasure Island was written by RLS just after returning from his first trip to America where he married. At a time when he was still an unknown author, inspiration came one summer in Scotland when bad weather kept the family stuck inside. To amuse his 12 year old stepson, RLS used the idea of a secret map as the basis of a story about hidden treasure. Taking inspiration from his travels, childhood trips visiting lighthouses, and basing the character of Long John Silver on his friend W. E. Henley, he sat down and wrote the adventure that became one of the most beloved pirate tales of all time. It gave Stevenson fame and was the first of many classic stories by him. Recommended for students Grades 5 to 8. 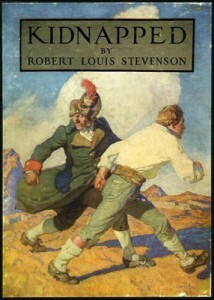 One of Stevenson’s most enduringly popular novels, Kidnapped (originally titled The Lad with the Silver Button) was inspired by real events in Scottish history. The Appin murder of Colin Campbell (aka the Red Fox) in 1752 sparked the biggest manhunt seen in Scotland at the time and eventually brought an innocent man to death after a prosecution that has been dubbed the “blackest mark on Scottish legal history.” This was ripe material for Stevenson to craft an adventure. Creating character David Balfour to act as a witness to history, Stevenson invents firsthand accounts about events which still remain shrouded in mystery. The story follows David who, after his miserly uncle has him kidnapped and taken to sea, is shipwrecked and must make a dramatic journey across Scotland to claim his inheritance. Witnessing the murder of the Red Fox, the young man’s life is soon in danger as he attempts his return home with new friend Alan Breck Stewart. Background: In 1870, Stevenson received a copy of The Trial of James Stewart. It was the official record of the trial of Stewart as an accomplice in the murder of Colin Campbell of Glenure. Compelling to such a passionate Scotsman and trained advocate, Stevenson was outraged to learn how a man without any evidence against him could be sentenced to death simply to satisfy clan revenge and a vengeful government determined to end the Jacobite rebellions. The entire episode was thoroughly investigated by Stevenson, with him and his father visiting Appin to check on facts and pick up local information and details – including a name which was still being handed down in the area as that of the real murderer. In this way Stevenson was able to cleverly weave together his fiction with historical fact, creating a seamless adventure in which the reader is transported to another time.